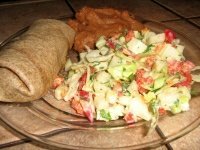 This delicious Mexican coleslaw recipe is an adaptation from one of the many great recipes we receive from "the Cooking Club". We adapted this one to make the dressing vegan. This coleslaw offers a zippy blend of flavors and an added cruch by using some non-conventional ingredients. Add all coleslaw ingredients to a large bowl and toss to combine. In a small bowl whisk the dressing together until blended well. Toss coleslaw with dressing, cover and refrigerate for about an hour to blend the flavors. Before serving, sprinkle with pepitas and garnish with the chopped avocado. * You can make vegan buttermilk using lemon juice or vinegar: Place 1/2 tablespoon lemon juice or white vinegar in a measuring cup. Add in soy milk to equal 1/2 cup. Stir and allow to stand for about 10 minutes. Use unsweetened, unflavored soy milk to avoid adding unwanted flavors. We served ours with some Amy's veggie burritos and some refried beans. A little Sangria can't hurt either!